At 20 years old, the Dental Hygiene program’s sterilization lab was about the age of the students using it – and it showed. As with all things, equipment and cabinets wear out – but they’re not inexpensively replaced in a complex profession such as dental hygiene, noted SUNY Broome President Kevin E. Drumm. 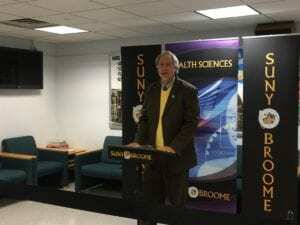 Enter the Sixth District and Broome County Dental Societies, which had the foresight to set up their own Dental Hygiene Endowment Fund more than 15 years ago through the Broome Community College Foundation. Under the leadership of Dr. Alfonso Perna and Dr. Anthony Palombaro, the two dental societies came together and donated the $10,000 that created the initial fund. “Most community colleges don’t have dental hygiene programs because they’re very expensive to run. And of the ones who do, we may be the only one blessed with an endowment of this sort,” said Dr. Drumm at an Oct. 27 ribbon-cutting for the newly renovated sterilization lab. “We could not have finished the project without the Dental Societies Endowment Fund,” said Dental Hygiene Chair Maureen Hankin, who was thrilled to see the completion of the project. The lab space features entirely new cabinetry, as well as new, touch-free sinks and an additional handwashing station, all of which will help the program retain its accreditation. Students will have the opportunity to learn on equipment and in a space that mirrors what they’ll find in the professional world once they graduate, Dr. Drumm said. Snip, and the ribbon falls! The sterilization lab is part of SUNY Broome’s Dental Hygiene Clinic, which provides dental hygiene services at little or no cost to members of the community. Students – who are under supervision –serve around 1,500 patients annually, delivering approximately $300,000 worth of dental hygiene services. Over the past five years, the value of the services they render exceeded $1 million. President Drumm thanked Dr. Perna, Dr. Palombaro and the current leaders of the two dental societies for their essential work, as well as the BCC Foundation, Dean of Health Sciences Amy Brandt and the Dental Hygiene faculty and staff. Following the ribbon-cutting ceremony, Professor Hankin gave visitors the opportunity to tour the newly renovated sterilization lab, as well as the entire Dental Hygiene Clinic.